For those who follow me on Facebook, you’re aware of my computer woes. My computer took a hard crash – completely and utterly dead with no hope of revival – while in the midst of a presentation while I was teaching. I’m set up on a temporary computer while we see about getting mine fixed. And I thought I’d update a bit as to my teaching engagements this year. 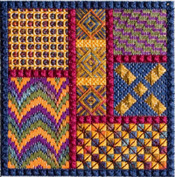 First up is teaching Angles at Sandy’s Cross Stitch on the Go in Hendersonville, NC, April 18-20. No ghosts allowed, but never fear, I’m teaching Angles again. Next up is Angles at Needle Orts in Altamonte Springs, FL, May 19-20. I don’t know about ghosts for this one, but if you’ll contact Debbie at the shop I’m sure she’ll be happy to discuss with you. And then, Angles again at Mid-Eastern Region Seminar in Syracuse, NY, June 1-3. No ghosts for this class since it’s a seminar. Time for something new, Adagio! I’ll be teaching Adagio July 7-8 for San Diego ANG. Ghosts will be permitted for this class; contact me and I’ll put you in touch with the class organizer. I can’t put up a picture because of the whole computer crash/on a temporary computer/can’t access my files thing, but I did post of picture on my Facebook page. 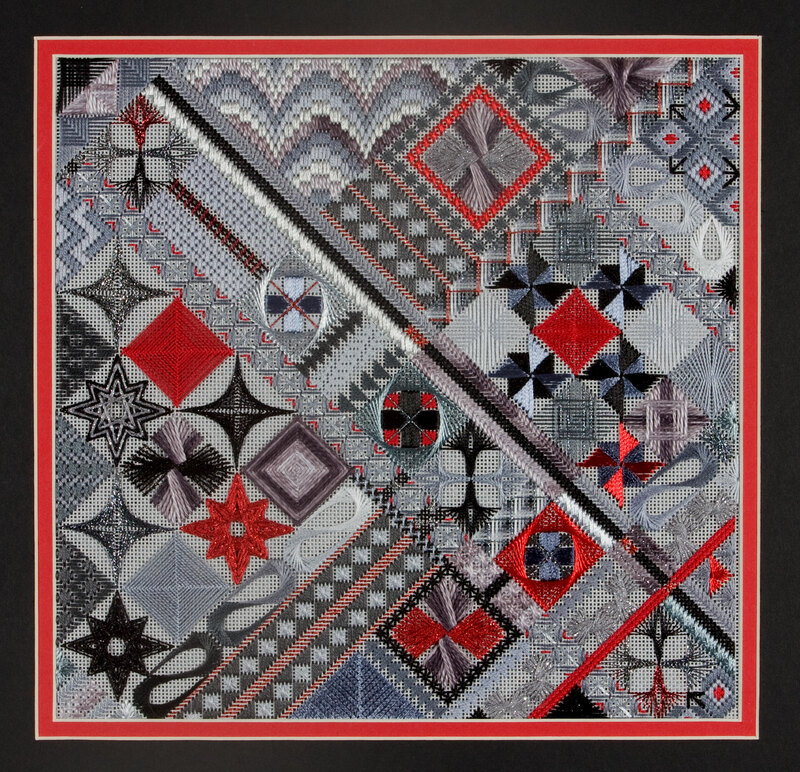 July 11-14 I’ll be teaching for the 14th Annual Needle Arts Mystery Retreat in Riverside, CA. Of course, I can’t show a picture of what I’m working on, but I’m so pleased with the way my design is turning out! The project is revealed at the opening reception for the first night. We have allowed ghosts, so visit the website, www.NeedleArtsMysteryRetreat.com for more info and to register. Wonderful time with great stitchers and some of my best teaching buddies, Linda Reinmiller, Patricia Hartman and Mary Knapp. 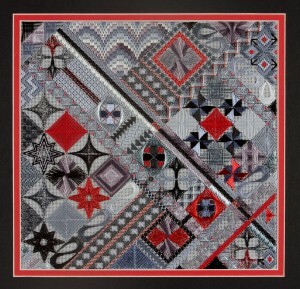 Then it’s on to American Needlepoint Guild National Seminar, Washington DC, August 22-27. I’ll be teaching two new classes, Cornered and Gilded Cabochons. Sorry I can’t put a picture up here, but you can go to the website, www.needlepoint.org, to see pictures and find out how to register. Hope to see you there! Annual seminar is always so much fun, and it’s so much more than taking classes. There may be more classes later in the year, discussing with a couple of groups about adding dates, and I’ll put up that info when the details are ironed out. And next year is starting to fill up, with Canvas A Needlepoint Adventure in January, EGA South Central Region and Tennessee Valley Region in June, Needle Arts Mystery Retreat in July, ANG National in August, and who knows what else!